Armstead made No. 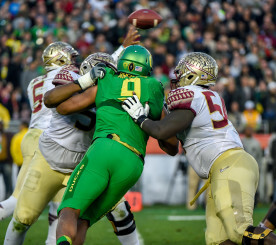 1 draft pick Jameis Winston’s life a living hell in the Rose Bowl. Day 1 of the NFL draft is in the books, and Arik Armstead has found a familiar home in San Francisco with the 49ers. Armstead was taken 17th in the first round by the Niners, with the intention of replacing major holes left in their defense from the offseason. My first thought is that I owe a friend of mine 20 bucks, because I bet him Armstead would fall to the 2nd round. I have never been so glad to feel like an idiot. In a draft saturated by edge rushes and outside linebackers, Armstead shines as one of the most athletic nose tackles in the draft. What happened to the 49ers’ defense during the NFL offseason can only be described as Murphy’s Law. Everything that could go wrong, went wrong. Defensive genius (admit it) Jim Harbaugh left to coach Michigan, Patrick Willis and Chris Boreland retired way before their prime, Navarro Bowman‘s knee is in two pieces, and Perrish Cox left for Tennessee. That is just everything aside from the defensive line. On the defensive front, Ray McDonald has signed with the Bears, leaving the left end spot wide open. The 49ers still have Glenn Dorsey at the defensive tackle position, and Justin Smith at the right end, both of whom will be 30+ years old by the beginning of the season. The 49ers also have several experienced defensive linemen in their arsenal, such as Ian Williams, Tank Carradine, Darnell Dockett, and others. 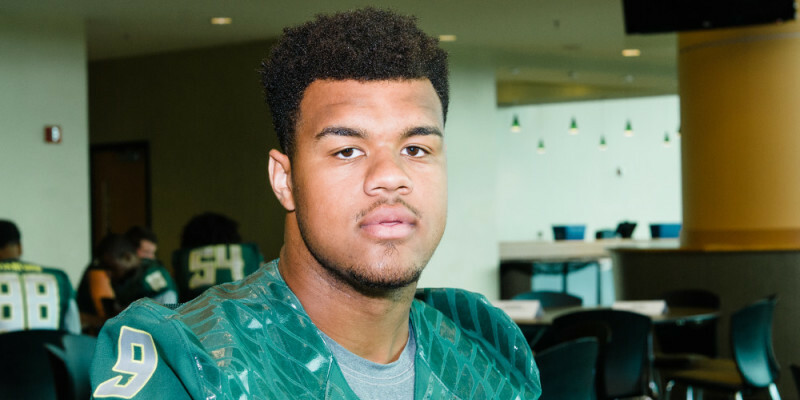 None of which, however, seem to have as high of a ceiling than Armstead, who at 6’7″ and 290 lbs ., has the potential to be a dynamic playmaker. The 49er’s run a 3-4 defense just like Armstead ran with the Ducks, which will make the transition to the NFL easier for him. With Dorsey assuming the role as nose tackle, Armstead will be able to get experience rushing off the edge, as well as playing the defensive tackle position. Additionally, Armstead is a west coast kid – born and raised in Sacramento, about 115 miles from Levi Stadium. The 49ers play in the NFC West, a very run-heavy division, and need all the help stuffing the run that they can muster. 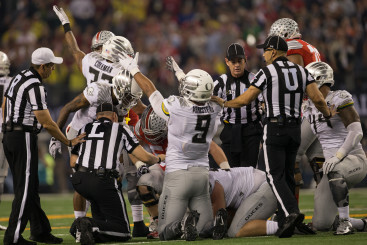 Armstead making plays in the national title game. First year prediction: Armstead will not make an immediate impact for the 49ers. It will most likely take him a few games to get adjusted to the NFL. I think the turning point will be Week 5, when Armstead will go up against a pathetic New York Giants offensive line. He will most likely not win defensive Rookie of the Year, considering how many defensive studs there are in this draft, but I would not be surprised to see Armstead take part in a pro bowl within the next 5 years. Stat prediction: 34 tackles, 3.5 sacks, 2 forced fumbles.